Though it's not the least expensive siding option, long-lasting stucco may be the most aesthetically versatile, enabling homeowners to create custom looks. Animal hooves and horns. Wheat paste. Urine. Beeswax. Rye whiskey. No, these aren’t the makings of a potent witches’ brew. Rather, at one time or another in history, each was used in stucco. Nowadays, stucco consists of less exotic stuff. Usually, it’s a mixture of Portland cement, sand, and either lime or gypsum. Combined, these ingredients form a plaster that protects and beautifies home exteriors. 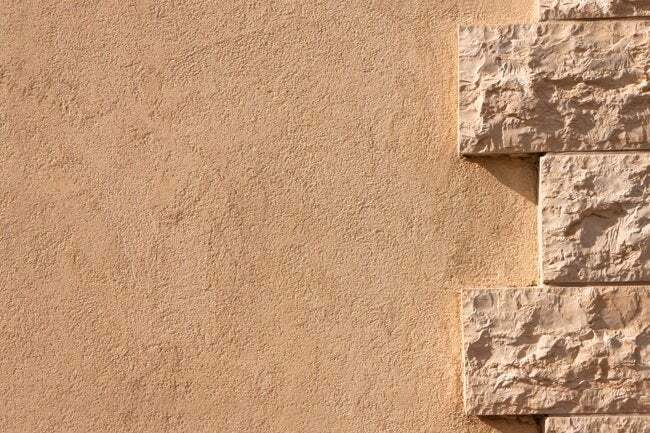 With any kind of masonry, whether it’s fieldstone or concrete block, stucco can be applied directly to the structure. With wood structures, the story is somewhat different, in that lathe must be added, so the stucco has something it can adhere to. Stucco application typically requires three coats. The initial “scratch coat” provides adhesion to the building. The “brown coat”, which comes second, is responsible for creating an even surface. Finally, the “finish coat” determines the stucco’s outward appearance. Throughout this three-stage process, the surface to which the stucco is being added must be kept wet. In a very hot climate, since stucco gets stronger the longer it’s allowed to dry, it’s best if the work can be done late in the day; even better is if the house can be shaded. Don’t be fooled into thinking the only look you can achieve is that of the typical hacienda-style house. Although stucco is most often whitewashed, a varied range of textures and colors is within reach. Options include but are not limited to stucco that resembles wood timbers, bricks, metal, granite or aged limestone. Indeed, the Technical Services Information Bureau lists 30 different finishes on its website. Compared to other siding types—vinyl, for instance—stucco involves, if not pricey materials, then high labor costs. Balance the expense against the fact that, because stucco can be finished in so many ways, it’s one of the most aesthetically versatile materials available, enabling homeowners to create unique looks. One attribute that is simultaneously both positive and negative is stucco’s permeability. In rainy parts of the country, wood framing under stucco may be susceptible to rot. 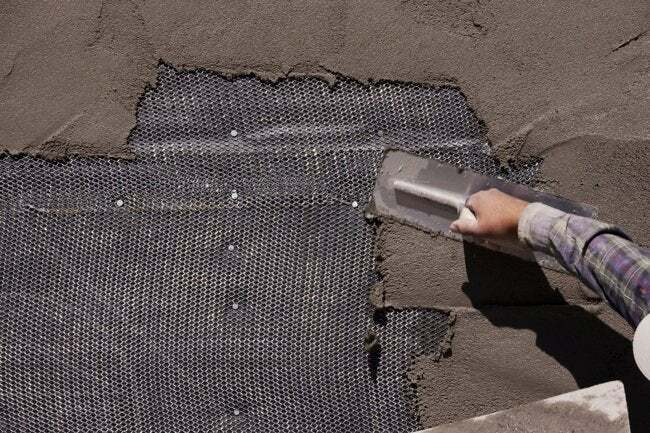 But by the same token, in regions with normal levels of precipitation, the breathability of stucco allows moisture to evaporate quickly, leaving the home safe and dry. Because stucco is less flexible than other siding choices, it’s likely to crack in situations where the ground shifts on account of tremors or settlement. Stucco can be cleaned with mild detergent and a rinse from the garden hose. Using a power washer is not recommended, as the force of the spray can result in damage to the plaster. While it’s cheaper than re-stuccoing, painting stucco can lead to a host of moisture problems down the line, since the majority of exterior paints are designed to form a non-breathable membrane through which water is unable to escape. Stucco typically lasts between 50 and 80 years. When it’s time to refresh yours, sandblast away the old layer and start from scratch. Patch small cracks with commercially available stucco fillers. (Never use caulk; it flexes differently than stucco and can wind up causing damage, not alleviating it.) For larger repairs, chip away any loose portions of the material and re-plaster. Plastering is an art form not easily mastered by the novice or intermediate DIYer. With the exception of small projects, the wise course is hiring a professional to handle your stucco job.